Scheda: Nazione: GB - Produzione: British Actors - Distribuzione: British Actors, Mutual Film - Soggetto: dal Macbeth di William Shakespeare - Adattamento: J.M. Barrie - Formato: B.N., muto - Durata: 30'. Cast: Edmund Gwenn, Nelson Keys, Godfrey Tearle, Owen Nares, Norman Forbes, Caleb Porter, George Kelly, Ernest Thesiger, Gladys Cooper, Teddie Gerard, Pauline Chase, Frederick Volpe, Moya Mannering, A. E. Matthews, Marie Lohr, Frederick Kerr, Irene Vanbrugh, Eva Rowland, Arthur Shirley, Leslie Henson, Florence Alliston. Plot Summary, Synopsis, Review: IMDb - allmovie.com - nytimes.com - neverpedia.com - query.nytimes.com - en.wikipedia.org - bioscopic.wordpress.com: «...The Real Thing at Last was a professional film production by the British Actors Film Company, for which Barrie supplied the script. 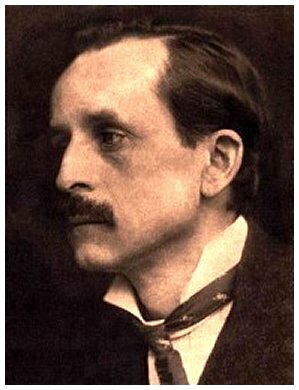 1916 was the tercentenary of Shakespeare’s death, and among numerous celebratory productions, there was to be a Hollywood production of Macbeth, produced by D.W. Griffith and starring the English actor-manager Sir Herbert Beerbohm Tree. The idea of Hollywood tackling Shakespeare filled many with hilarity, and Barrie wrote a thirty-minute spoof which contrasted Macbeth as it might be produced in Britain, with how it would be treated in America. The film starred Edmund Gwenn as Macbeth, and among a notable cast Leslie Henson and A.E. Matthews both have left droll accounts of its production. The film had a director, L.C. MacBean, but according to Matthews, ‘Barrie did all the work – MacBean just looked on admiringly’. The film gained all its humour from the contrasts in the British and American interpretations of Macbeth. In the British version, Lady Macbeth wiped a small amount of blood from her hands; in the American she had to wash away gallons of the stuff. In the British, the witches danced around a small cauldron; in the American the witches became dancing beauties cavorting around a huge cauldron. In the British, Macbeth and Macduff fought in a ditch; in the American Macbeth falls to his death from a skyscraper. The intertitles were similarly affected; a telegram was delivered to Macbeth that read, ‘If Birnam Wood moves, it’s a cinch’. Sadly, no copy (nor even a photograph, it seems) of this happy jest of Barrie’s is known to exist today...».